As a product manufacturer with high labor content, the work force at NAI is critical to our success. Therefore, over the years, we have established unique systems to grow the expertise and professionalism of our personnel. As a result, we achieve levels of learning, commitment and teamwork that inspire passion and motivation. 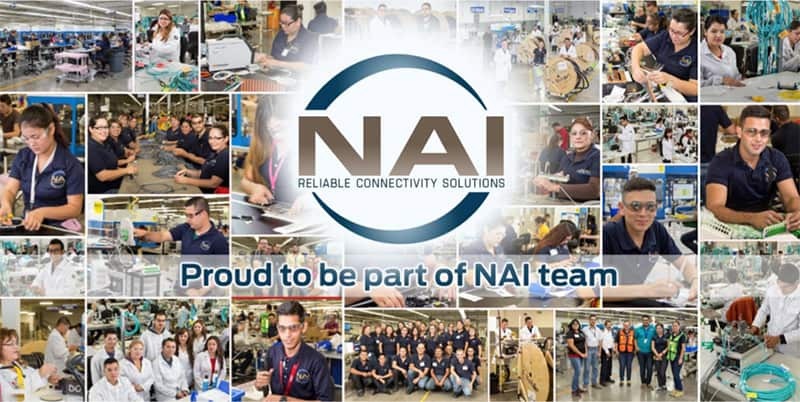 To maintain a capable labor force in an ever-changing manufacturing environment, NAI has an entire team of expert trainers to work with new hires and establish specific training programs for each of them. Once the trainees move into production, the trainers continue to work with them, and efficiency and quality levels are tracked. To promote leadership among the labor force. To shift the labor force from being committed to becoming highly motivated. NAI promotes a list of 21 qualities to become a leader. The NAI “U” defines a model for leadership and provides the training and tools for the development of leadership skills. We’re driven to make totally reliable connectivity solutions for our customers. Our global team creates innovative cable assembly assemblies to make our customers’ products perform reliably, as well. We are passionate about providing the critical link for life, flight and communications. And we take pride in making NAI a vibrant, rewarding place to work. NAI’s rich history of growth is made possible by our entrepreneurial-minded employees who help us make an impact around the world. We believe in holding ourselves to a higher standard. And working with each other to leverage our unique expertise to transform the future. Every day our employees embrace our mission, push the limits of innovation and focus on insights that lead us to an even better tomorrow. NAI is seeking candidates for hourly positions at its Gaylord, MI plant and has partnered with Flexible Staffing to take applications.